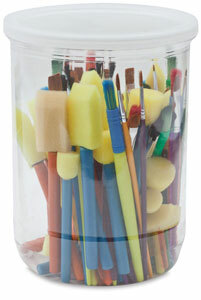 Children's Brush Assortments offer a fantastic selection of kid-sized brushes at a great, economical price. These assortments include foam brushes, foam dabbers, chubby brushes, and artist brushes in a variety of shapes, sizes, and fun, bright colors. This assortment contains 10 foam brushes, 10 foam dabbers, 15 chubby bristle brushes, 30 nylon watercolor brushes, 15 Camel Hair brushes, and 20 synthetic Flat Angle brushes for a total of 100 brushes.